Download the seminar report on the revolutionizing material form and control technology 4D Printing. Get the best PDF reports to study and learn the concept of 4-D Printing. 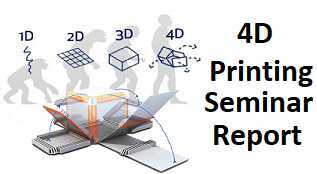 The seminar report on 4D Printing Technology discusses the working of 4D Printing, the material used for 4D printing and its future applications. The Seminar report also emphasizes the difference between 4D printing and 3D Printing technology. According to Wikipedia:" 4-dimensional printing (4D printing; also known as 4D bioprinting, active origami, or shape-morphing systems) uses the same techniques of 3D printing through computer-programmed deposition of material in successive layers to create a three-dimensional object". The term 4D printing is developed in a collaboration between MIT´s Self-Assembly Lab and Stratasys education and R&D department. In February 2013, Skylar Tibbits, co-director, and founder of the Self-Assembly Lab located at MIT´s International Design Center unveiled the technology “4D printing” during a talk at TED conference held in Long Beach, California. (TED, 2013) 4D technology is still in the early phase of research and development. This technology has been used only in a few labs or prototyping facilities. In the current scenario, one can´t just order and buy “4D printer”. As of 2017, MIT´s Self-Assembly Lab, 3D printing manufacturer Stratasys and 3D software company Autodesk are the key players in the development of 4D printing technology. In the seminar report, it discusses the smart materials along with the input force they require and output. 4D printing with the light responsive smart material is effective and suitable because the light is available easily to work, a wireless source, easy control, and light energy has the ability to create rapid changes in the material. In order to continue with the 4D printing process, it is really important to know about the smart materials and their behavior. The relationship between the chemical composition of shape changing polymer and its physical properties such as thermal, mechanical, optical and electrical properties. The seminar report further elaborated the 4D Printing Process, fabrication, Joint and folding angle strands, Custom Angle Surfaces, Curved surface Folding, Surface Curling, 4D printing example: Orchid transformation when immersed in water. The 4D printing Seminar report also discusses the future advancement of this mechanism. Furthermore, this seminar report investigates challenges and obstacles while adopting these printing technologies. Existing 4D printing process, ongoing development, and future application areas and major factors that separate 4D printing technology from 3D printing are discussed. The result section includes the rating of these two technologies based upon SWAT review and market analysis of both the printing industry.